NImbuzz Mobile lets you call, chat message, and send files on the go, for free. It combines all your buddies from Skype, MSN, yahoo ICQ, AIM, Google Talk and more. One login, one contact list, all accounts. -Save Money: Instead of calling minutes, Nimbuzz uses the internet to let you make free international calls to your buddies. You can also register your voip account to call your friends on landlines and mobile phones. -Locate your Friends: Share your location and retrieve the location of your buddies on a map. Great for arranging face to face meetings. -Make yourself heard: If your buddies are offline, let them know you&rsquo;re trying to get in touch by sending them a "Buzz". It will start Nimbuzz Mobile on their mobile phone. -Never lose your Contacts: Use the Phonebook to back up and restore your contacts. Contacts will be backed up online. Comes in handy when you have lost your mobile phone. - Internet enabled mobile device or pc with data connection required. 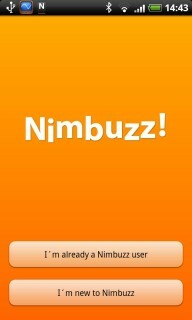 - Nimbuzz will NOT invoice you for anything. - Calls will be connected via a local access number for which the operator will only charge local minutes. &middot; Message Delivery Notifications will display checkmarks when your message arrives on your friend&rsquo;s phone. &middot; New Favorites Tab offers quick access to your favorite contacts so you can start chatting and calling faster. &middot; Reintroduced the # shortcut &ndash; by pressing the # key you will go to the top of your contact list. Path Talk Apps Apk Fo..
Nimbuzz Messenger Free Calls F..